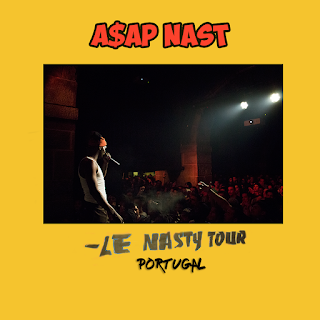 A$AP Nast at Musicbox: from New York to Portugal | Watch and Listen! Na passada quarta-feira, dia 27 de Abril, fomos até ao Musicbox para o concerto do rapper americano, A$AP Nast. Para quem não sabe, A$AP Nast é um dos membros do grupo de hip hop A$AP Mob, que conta também com A$AP Rocky e A$AP Ferg. Tariq Devega veio sozinho ao Musicbox, no concerto que marcou a sua estreia em Portugal. Fica a promessa de trazer o grupo todo numa próxima. O horário tardio, a dia de semana, não impediu o Musicbox de ficar irrespirável para receber o músico e nem os atrasos aborreceram ninguém. O que se queria era ver o fantástico Tariq Devega em ação, demorasse o tempo que demorasse. E assim foi. Com alguns minuto de atraso, finalmente deu-se início ao concerto. Após uma extensa introdução, com direito a todo o suspense merecido, A$AP Nast entra em palco levando o Musicbox à euforia. Durante uma hora e pouco o Musicbox dançou, saltou e gritou "A$AP Nast" sem pausas. Enérgico e sempre motivador, Tariq deu um concerto deslumbrante e mostrou ser um animal de palco. Não houve pausas para descanso do início ao fim, e o público deixou-se envolver numa dança bastante movimentada ainda que pouco coordenada. A$AP Nast ainda convidou um fã a cantar algo com ele, pelo que o fã optou por cantar algo sem muito sentido em português. Foi um momento divertido e bastante apreciado pelos músicos. Após isto, alguns fãs da banda ainda foram convidados a subir a palco para dançarem e saltarem com Tariq. Foi sem dúvida um dos melhores concertos que o Musicbox recebeu até agora neste ano, com o selo de honra da Match Attack. Ficam os parabéns. 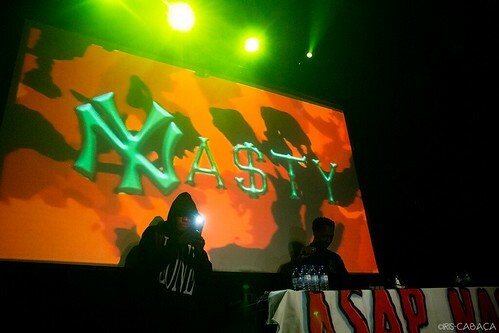 On the last Wednesday, 27th April, we went to Musicbox to see the American rapper A$AP Nast. For those who still don't know him, A$AP Nast is one of the members of the A$AP Mob, a New York hip-hop group. This group counts not only with A$AP Nast but also with A$AP Rocky and A$AP Ferg. We bet you already heard at least the name A$AP Rocky. We advice you to listen to other members of the group if you still don't know them .Tariq Devega, more known by A$AP Nast, went to Portugal alone this time for a concert at Musicbox, in Lisbon. This was his first time in Portugal, and the expections were high. It was getting late and even though it was a Wednesday night, that didn't stop all his fans to almost sold out the place. There was a little delay but that didn't bothered anyone. The only thing people wanted was to see the awesome rapper, even if they had to wait all night for him. A bit later than foreseen, the musicians get on the stage and start with a thrilling introduction. It had all the suspense that it deserve, and finally A$AP Nast gets on the stage and drives Musicbox to madness. The fans were happy, excited and screamming "A$AP Nast" all over the place. For an hour everybody danced and jumped with the energic and unstoppable Tariq Devega. The rapper revealed to be an energic musician and gave a enthusiastic concert from the beginning to the end. There was no time for pauses, and we can affirm that A$AP Nast is a stage animal. Fantastic indeed. During all the concert, people joined for a uncordinated but dynamic dance. A$AP Nast invited a fan to get on the stage to sing something, and the fan sung something without much sense but it was a funny and unique moment that everybody enjoyed a lot. After that, the rapper also invited people to dance and jump with him on the stage. It was one of the best concerts we saw until now at Musicbox, with Match's Attack seal of honor. Maybe in the future we will be able to see the whole crew together in Portugal. We can't wait for that epic concert.